Following last year's Two Horses LP, Montreal folk rock songwriter Charlotte Cornfield has released a feel-good video for the album cut "All of the Pretty Mistakes." 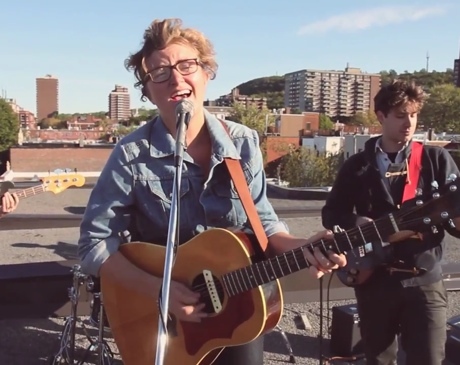 The clip finds Charlotte and her band playing the upbeat pop track on top of the singer's apartment building. As they soak up the last rays of the setting sun, some of the folks from the apartments below hear the music and abandon their games of Jenga to come start a dance party on the roof. Eventually night falls, but the onlookers luckily have some sparklers on hard just for the occasion. Cornfield recently launched a songwriting project called #CharlotteOnDemand, which allows fans to submit ideas (themes, lyrics, stories, etc.) that she then she turns into songs. Stay tuned for songs to arrive on Facebook.